If you're like me, you must have that one stamp set for each season that you tend to use a lot. 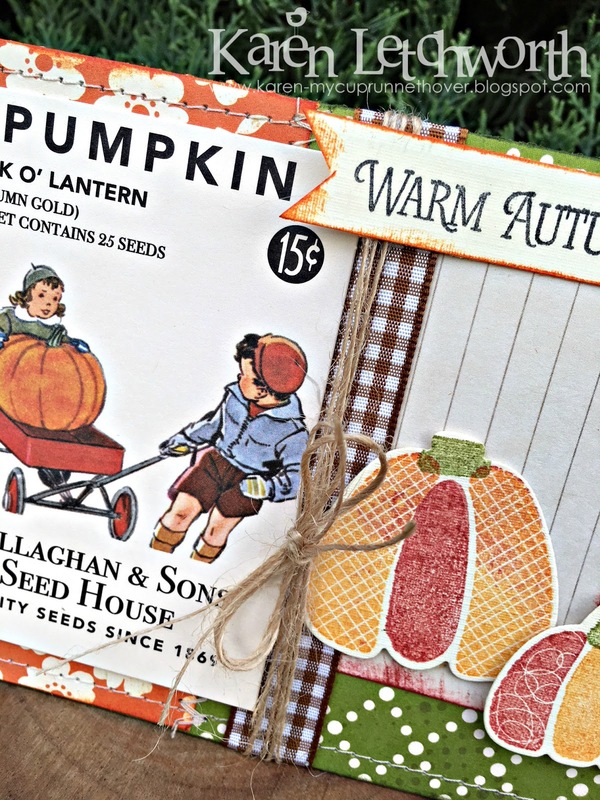 For me, that's this pumpkin set from Papertrey Ink. I love it, and I use it quite a bit this time of year. 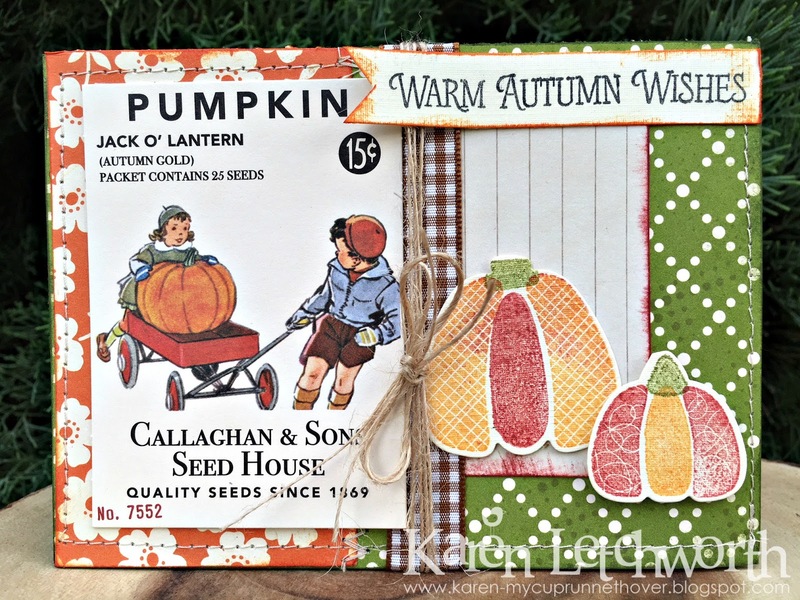 I used some October Afternoon patterned papers, an October Afternoon cute little "pumpkin" journalling card and part of another 7 Gypsies journalling card as my base. I added some Brown Plaid Ribbon and wrapped Natural Burlap String around my card for added texture. I stamped two of the pumpkins in this stamp set, and cut them out with the coordinating die-cut. The smaller one is raised up with 3-D tape. The sentiment is also from this stamp set and is stamped in Black Soot, and I inked everything with Tim Holtz Distress Inks in Marmalade, Green Paint, and Brick Red. A bit of machine stitching was the final touch. I'm playing along in these challenges, and I thank you for visiting! 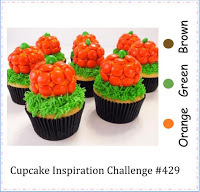 Cupcake Inspirations Challenge #429 - Sponsored by Newton's Nook - I sure enjoyed this color inspiration, and loved stamping the pumpkins. I also made sure to add the brown ribbon! Oh I love the vintage feel of your card! Wonderfully done! Thanks so much for sharing with us at Cupcake Inspirations! Karen, that is so gorgeous. Love that autumn vintage look. This is beautiful Karen! Love the vintage look it has! So sweet! I love the vintage kids on your beautiful card! I just went looking for (and found) some vintage children digis to use in my cardmaking. The twine and brown checked ribbon add just the right touch to you lovely card. Thanks so much for linking this up to the Cropstop blog! This is great, so much detail in this Autumn project, I love the vintage look. I am so sorry it has taken so long to leave a comment on your blog, the link-up is back on at JKOC so hope you will join in again.